Picture this: Your wedding day has come and gone, and everything went off without a hitch. Your closest friends and family cheered you on as you walked down the aisle and married the love of your life. Don’t those friends and family deserve an extra special thank you for all their love and support? Nothing can replace the traditional hand written personal thank you stationery, but in addition to a personal thank you, consider one of these five unique ways to say thank you. 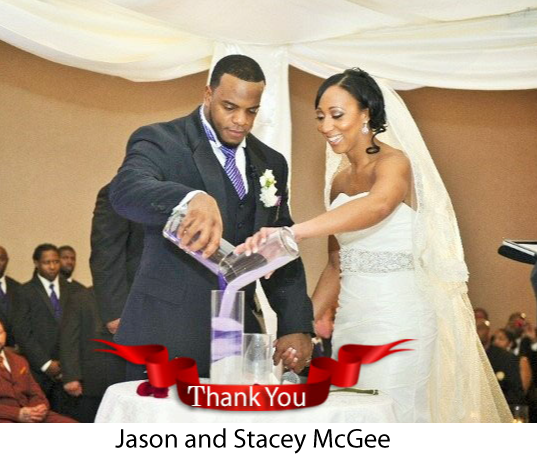 Take one of your wedding day photos and create a special Thank You banner or sign (like the one above) and along with a special note send one to each of you guests to show them how much you truly appreciate their support. For a cute day-of thanks, include a small note at each place setting thanking your guests for sharing your first meal as husband and wife. A thank- you video is the closest you can get to thanking each of your guests in person. It gives you the freedom to be yourselves – whether that’s funny or sincere, or a little bit of both. Post it on your wedding website, email it to all your friends or send DVD copies to your loved ones. You had a photo booth at the wedding, so bring it full-circle and snap a few photos that capture the excitement and joy of the celebration and showing your guest how much you appreciate their support. Include the photos with a personalized thank you note. How will you thank your family, friends and guests for sharing in your big day?